In the outdoor play space at Kettle Moraine YMCA Early Learning Center in Wisconsin, a Little Tike’s kitchen stands, covered in vining flowers. Tomatoes, carrots, peppers, peas, sweet corn, and sunflowers grow nearby. Children, three to five years old, are invited to come and help with planting, watering, weeding and harvesting. Educators enjoy sharing the garden’s many teachable moments with the center’s 36 students, including the chance to taste-test new veggies. 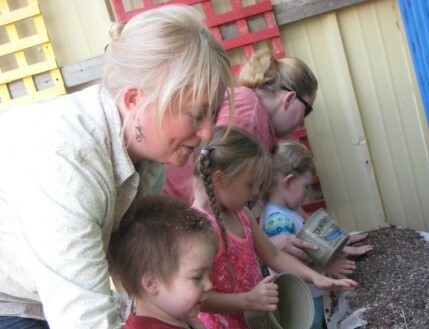 Kettle Moraine YMCA Early Learning Center’s garden started in a space of just six square feet, when the center bought a two-by-three foot indoor greenhouse for students to start seeds in their classrooms. Parents donated seeds and compostable plant containers, and they were off and growing. “We decided to start the outdoor garden so the plants would continue to survive past the size they could reach in their indoor pots,” Melissa Kescenovitz, the center’s lead teacher and coordinator, shared. Kescenovitz sees the Early Learning Center garden, which started in 2012, continuing through many generations. “We plan to continue gardening,” she said. The Early Learning Center is one of several early childhood programs at the Kettle Moraine YMCA. The Discovery Center (for infants to two-year-olds) and Our Savior’s Childcare Center (an off-site YMCA site for infants to five-year-olds) also have early childhood gardens. At Taos Pueblo Head Start in New Mexico, preschoolers are learning more about healthy eating by gardening, trying new foods and participating in family-style dining. Local Foods — Childcare Center Production Gardens is a complete “how-to” guide about fruit and vegetable gardening with children. It teaches childcare providers how to engage young children in using fresh produce from a production garden for cooking and eating, as well as instructions on composting. The guide is in eight well-organized brief chapters.